If he secures an impressive triumph in his upcoming bout, Filipino standout Joshua “The Passion” Pacio might place himself on the verge of another shot at the ONE Strawweight World Championship title. However, the 21-year-old native of Baguio City, Benguet revealed that he is not in a hurry and would rather take the long road to a second championship crack than prematurely vie for the gold-plated strap. Pacio earned his lone previous title shot when he defeated gritty Thai grappler Kritsada Kongsrichai via first-round submission in August 2016 to set up a date with ONE Championship’s reigning strawweight kingpin Yoshitaka Naito. Naito derailed Pacio’s title aspirations in October 2016 as the Japanese champion pulled off a come-from-behind win by submitting the Filipino fighter with a rear-naked choke in the third round to keep the coveted ONE Strawweight World Championship belt around his waist. Winning ONE Championship’s flyweight top prize was within reach of Pacio as the 5-foot-4 Team Lakay young gun effortlessly stuffed all five takedown attempts of Naito in the first round and peppered his Japanese foe with lunging right hands and spinning back kicks. Although Naito was able to take him down to the mat in the second period, Pacio was able to inflict damage while defending on his back. But it only took one mistake to crush Pacio’s dream to become the youngest Filipino to win a world title in mixed martial arts (MMA) as Naito latched on a rear-naked choke that ended his undefeated streak. Pacio saw his heartbreaking setback to Naito as an important lesson because it gave him an opportunity to patch the loopholes in his outstanding skill-set. “It’s not a defeat. I viewed as an important lesson. It also served as an inspiration to push myself to the limit. It is an eye-opening experience. Here I am standing in front of you as a matured competitor inside the cage,” Pacio stated. Pacio reaped the fruits of his labor this past March when he scored a huge victory over former ONE Strawweight World Champion Dejdamrong Sor Amnuaysirichoke by way of split decision. “Every martial artist should have the sense of growth. This sport is constantly evolving, and every fighter should adapt to changes and improve their overall MMA game. It’s either you adapt or you fail. I learned my lesson, and I chose to adapt for the better,” Pacio shared. Now using the moniker “The Passion” due to his ardent desire to improve each day as a martial artist, Pacio returns to action on 5 August as he squares off with Japanese newcomer Hayato Suzuki on the undercard of ONE: KINGS & CONQUERORS in Macao, China. Suzuki might pose a threat to Pacio’s spot in the rankings, but the latter leans on the learning from the match-up that can benefit his maturity as a prizefighter. “Every fight is a lesson. We, as fighters, gain valuable knowledge every time we train and step into the cage. I am here to learn and grown. I will always be grateful with what I have. I have no problem if I need to prove once again that I deserve another championship opportunity,” Pacio asserted. 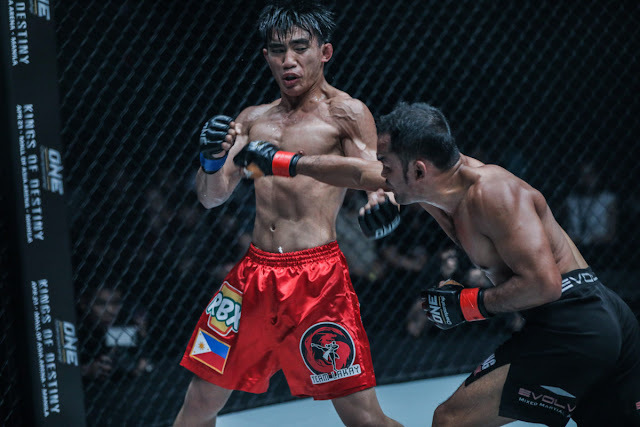 As he goes through another tough encounter inside the ONE Championship cage, Pacio remains optimistic that the ONE Strawweight World Championship title will be in his possession someday. “I don’t fear that my opponent has the ability to take my spot in the rankings. I am consistently improving. The goal is to win and improve. That’s my mindset right now. As I grind at the gym every single day, I know that the belt will be mine soon. Hard work cannot be denied forever,” he ended.